The Michigan Silverback: Space Hero! Today marks 50 years since John Glenn became the first American to orbit the Earth, less than a year after Yuri Gagarin's first flight. In April 1959, despite the fact that Glenn had not earned the required college degree, he was assigned to the National Aeronautics and Space Administration (NASA) as one of the original group of seven astronauts chosen for Project Mercury. During this time, he remained an officer in the United States Marine Corps. Junket? For a politician? Where would they get that idea? Oh. He opposed the Clinton impeachment only three months after his return to Earth. Never mind. Just a coincidence. Nothing to see here. Really. If we're going to honor a space hero today, then, let's do it right. In downtown Moscow, there still stands a hotel which remains, to this day, a monument to the fear generated by Stalinist tyranny. The Metropole hotel is a great heap of socialist realism dating back to the mid 1930s. It is highly asymmetrical: the left side of the building is plain, the right, quite ornate. The story goes that when the hotel was built, two plans were presented to Stalin for review, side-by-side, with a line down the center indicating that he needed to choose between the two styles. It's said that Stalin, who often didn't pay close attention to paperwork submitted to him, just scribbled his name and the word "Approved" across the middle of the page. And rather than tell their "Vozhd" ("The Boss") that he had screwed up, the terrified sycophants who surrounded him went ahead and ordered the hotel be built as approved, asymmetrically. Think of the implications of that for a moment. This was but one instance of rule by "The Boss", a tyrant surrounded by (real) yes-men who could not ever contradict him for fear of their lives. It is said he was so feared that his personal chamberlain kept spare pairs of pants ready to hand, so that those who went to see Stalin personally would have something to change into if they lost control of their functions out of fear of being in his presence. Rule by "The Boss" remained the curse of Russian life; Stalin's successors ruled much as he did up to 1992 when the Soviet system was (we hope!) overthrown. This is a story of a man who received an order from The Boss (and his lackeys), and, knowing full well that he was choosing slow death by fire, chose to take the mission rather than kill a national hero who also happened to be his best friend. 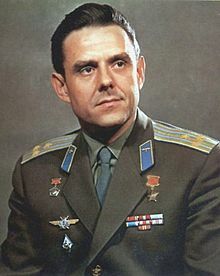 His name was Vladimir Komarov, and, in 1967, he was given a hideous choice: to go into space in a rattletrap spacecraft that was certainly not going to survive reentry... or refuse to board and let his secondary relief take the trip. Problem was, the secondary relief was Yuri Gagarin, his best friend and a national hero. It's been almost fifty years since 'Gaga' went into orbit--and half a planet away. But Gagarin was the Hero of the Soviet Union of the time (and he'd earned it, too); he was the Russian Niel Armstrong, first man into space. Had Gagarin died in orbit after Komarov refused the mission, Komarov would very likely have not lived very long. Furthermore, Komarov and Gagarin were personal friends; Komarov could not sentence his best friend to die so horribly. But the Vozhd ("The Boss"), in this case Leonid Breszhnev, ymech shemo, wanted a space triumph. The Americans had just lost three astronauts on the ground in the Apollo 1 fire. He wanted to demonstrate the USSR's technical superiority over the Americans, who were clearly pushing ahead in the race to the Moon. So the order came down: there must be a launch. Even if the Soyuz was as much a piece of deadly junk as Apollo 1. The craft simply wasn't ready for prime time--and both Komarov and Gagarin knew it. There remained hundreds of flaws, any of which could cause a failure and death for the pilot. But The Boss wanted a triumph--and the impenetrable wall of lickspittles who surrounded him would not let the truth get through. So Komarov went into space in the Soyuz 1 spacecraft--confronting Gagarin at the launch pad to prevent Gagarin from taking Komarov's place. The mission of Soyuz 1 on launch was to meet up with the Soyuz 2 craft, launched the day following, in an orbital rendezvous, and then return to earth. And what's worse, everything that went wrong he knew was going to go wrong. First, Soyuz 2's launch was cancelled, so the entire point of the mission was scrubbed even before reentry began. On orbital insertion, the solar panels of the Soyuz module failed to fully deploy, thereby preventing the craft from being fully powered and obscuring some of the navigation equipment. Komarov reported: 'Conditions are poor. The cabin parameters are normal, but the left solar panel didn't deploy. The electrical bus is at only 13 to 14 amps. The HF communications are not working. I cannot orient the spacecraft to the sun. I tried orienting the spacecraft manually using the DO-1 orientation engines, but the pressure remaining on the DO-1 has gone down to 180.' Komarov tried unsuccessfully to orient the Soyuz module for 5 hours. The craft was transmitting unreliable status information and communications were lost on orbits 13-15 due to the failure of the HF transmitter which would have maintained radio contact whilst the craft was out of range of UHF receivers on the ground. As a result of the problems with the craft, the second Soyuz module which was to have provided crew to perform an Extra-vehicular activity to Soyuz 1 was not launched and the mission was cut short. Komarov was ordered to re-orient the craft using the ion system on orbits 15-17. The ion system failed. Komarov did not have enough time to attempt a manual re-entry until orbit 19. Manual orientation relied on using the equipped Vzor device, but in order to do this, Komarov needed to be able to see the sun. To reach the designated landing site at Orsk the retro-fire would need to take place on the night side of the earth. Komarov oriented the spacecraft manually on the dayside then used the gyro-platform as a reference so that he could orient the craft for a night side retro-fire. He successfully re-entered the earth's atmosphere on orbit 19. He was killed after the module crashed when the drogue and main braking parachute failed to deploy correctly. The last line was not true; he died, horribly, and slowly, of burns long before Soyuz completed reentry. A story on National Public Radio's web site (discretion advised before viewing!) includes both a recording of Komarov's hideous last imprecations against those who sent him in space to die, and an even more hideous picture of his burned corpse in an open coffin. I hope that Leonid Breszhnev saw it. Gagarin, it is said, wanted to confront Breszhnev about it; legend has it he threw a drink in Breszhnev's face at a reception after the disaster. We do know this: Yuri Gagarin died in 1968, only months after the Soyuz 1 disaster, in what was said to be a plane crash. God rest him. And God rest Vladimir Komarov and may light eternal shine upon him, for "greater love hath no man than one who lays his life down for a friend." He reflected what is greatest and best of the people of Russia. And, unlike some NASAs I could name, the space program he died to build is still going strong.